Feedbands has a hair-brained plan that mixes cryptocurrency, crowdsourcing, and a vinyl subscription service. Amazingly, it’s actually working for artists. DMN is proud to be partnering with Feedbands as they grow their artist-focused concept. 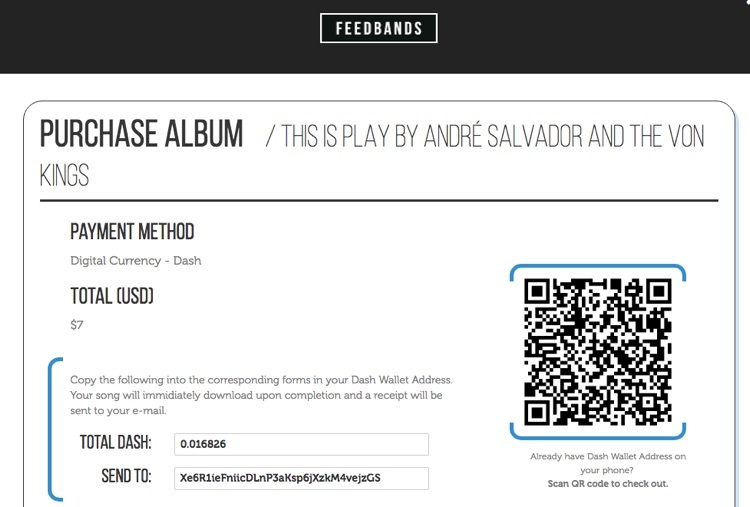 And if you’ve ever wanted to sell your music using crypto, Feedbands is a great place to start. Here’s what this company is building. The music industry is booming back to life. But the recovery for artists has been a little disappointing — if it can even be called a ‘recovery’. Earlier this month, Spotify’s founders and investors become overnight billionaires. But artists with millions of followers on the platform are still struggling to make ends meet. The good news is that there are still people trying to solve this giant problem. And some promising new models that are just getting started. If you haven’t heard of Feedbands yet, you might want a take a look at what they’re doing. Headed by Graham Langdon, the Asheville, NC-based company is combining vinyl subscription, crowdsourcing, cryptocurrency, streaming, and downloads into a potentially lucrative platform. The best part is that the payouts to artists are extremely favorable. According to the company, 99.99% of the earnings on a release go back to the artist — so effectively, $9.99 on a $10 album. Even worse, the fastest-growing platforms, like Spotify, Apple Music, and Amazon Music, aren’t solving the problem. So Langdon decided to focus on two areas that could benefit artists the most: vinyl and cryptocurrency. The vinyl subscription part is actually pretty simple. Basically, Feedbands has created a subscription vinyl platform with a twist. Members vote on their favorite music online (via streaming), and the top-ranked artists get a first-run vinyl pressing from Feedbands. Those members, in turn, get treated to a crowd-selected vinyl release every month. Power users know what’s coming, others get surprised. It’s basically a crowdsourced record label that revolves around vinyl. Actually, members can choose from several different plans. You can even opt to receive a vinyl record and t-shirt every month as part of your plan. It’s all automatically mailed to you (though you can also swap stuff if you don’t like the selections). On the artist side, the deal is pretty solid. Once selected for vinyl release, artists are paid in cash and their own pressings. Two valuable things to an artist, especially since vinyl can be turned into cash on the road (or, online or via a local store). Importantly, the vinyl is a first run, so Feedbands gets to debut the release. But the artist doesn’t relinquish any copyright control. There’s nothing binding beyond the initial pressing itself, and artists can leave whenever they want. But in order to maximize artist payments, Langdon’s model is heavily predicated on cryptocurrency. That is, one specific cryptocurrency called Dash. Langdon told Digital Music News that he decided upon Dash while heavily researching cryptocurrencies. The crypto is governed by a decentralized org structure, which helps to manage decisions about the underlying blockchain and coin distributions. Langdon liked Dash because it transacts quickly and has razor-thin processing costs — unlike the extreme mining fees that have bogged down mainline Bitcoin. The result is the 99.99% payout to artists. Even better, the Dash governing body also funds innovative ideas likely to broaden adoption and use of the altcoin. Accordingly, Langdon proposed a Dash-powered, unofficial SXSW showcase, and it all went swimmingly well. At the showcase, everything was powered by Dash, including vinyl, beer, and wine sales. Even tipping was conducted in the crypto. Back on the site, the economy is also largely powered in Dash. Fans can pay good ol’ American dollars for a monthly subscription, but the rest of the Feedbands economy is powered in Dash. That includes single and album purchases, which require a Dash wallet. So now, it’s time to grow this wild experiment and see where it goes. Of course, crypto has its critics. And, a bubble in Bitcoin’s valuation has tempered enthusiasm for the entire space, including altcoins. But Langdon sees a really big win for artists. “There’s a pretty big piece to getting the artists paid that cryptocurrency can play,” he said.